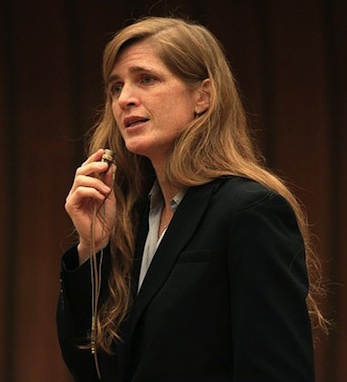 Irish-born Samantha Power was one of the forces behind President Obama’s decision to take action in Libya as Muammar el-Qaddafi and his forces brutally suppress the rebels. Power, the president’s adviser on foreign policy, is a former war correspondent. It was in Bosnia, covering the civil war and witnessing the atrocities committed, that she developed a belief that strong countries have a moral obligation to prevent ethnic cleansing and other blatant attacks on human rights. Born in Dublin, Power was nine years old when her family moved to the United States. In 1993, she graduated from Yale and went to work as a war correspondent in Bosnia, writing articles for publications such as The Washington Post and The Economist. Upon her return to the United States in 1995, she entered Harvard law School. In 1998, she co-founded the Carr Center for Human Rights Policy at Harvard. Still haunted by what she saw in Bosnia, Power began writing A Problem from Hell, her Pulitzer Prize winning book. Published in 2002, the book examines several mid-to-late 20th century totalitarian regimes and atrocities (Pol Pot and the Khmer Rouge, the Rwandan genocide), and delves into the issue of America’s accountability in turning a blind eye during those regimes and genocides.